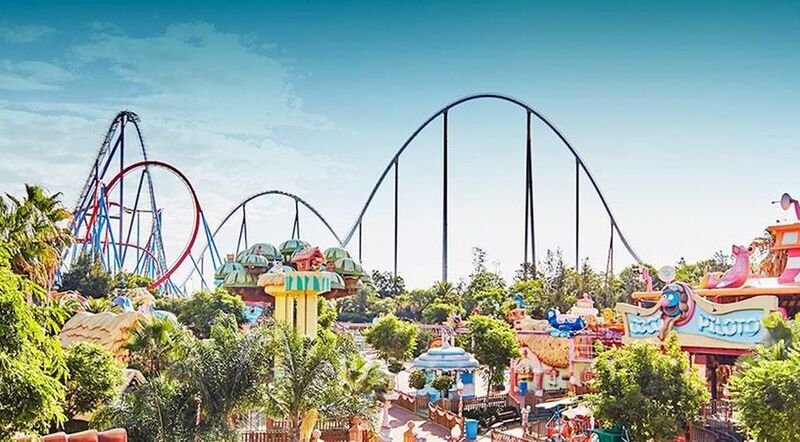 Spain's largest theme park (and one of Europe's biggest), PortAventura is a beguiling place with lush landscaping, charming architecture, and immersive themeing. While it's not on the level of a Disney or Universal park (which is intriguing, since Universal operated the park and resort at one time), it is a step above a typical park. In fact, some of its coasters and rides are among the world's most thrilling. The premise of the park is to take visitors on an around-the-world adventure over the course of a day. Instead of Epcot's world's fair/edutainment approach, the Spain park presents more whimsical and idealized interpretations of locales, including Polynesia, Mexico, China, the Far West, Italy, and its all-encompassing ode to southern Europe, which it dubs Mediterrania. To a US expat, it can be fascinating to see how the Spanish park presents its take on America's cowboy-infused Old West. In 2017, PortAventura opened Ferrari Land, a 15-acre ode to the esteemed Italian carmaker. It features Red Force, which at 112 mph and 367 feet is Europe's fastest and tallest roller coaster (and among the world's fastest and tallest coasters). It uses a magnetic induction launch to catapult its trains up and over a top hat tower. In 2018, Ferrari Land welcomed an area for younger kids that included a junior roller coaster. Among the park's other wild rides are Furius Baco, a truly harrowing, ultra-high speed (one of the fastest in the world), and utterly unique launched coaster, Shambhala, an exceptionally tall, fast, and smooth hypercoaster, the highly acclaimed Dragon Khan multi-inversion steel coaster, Stampedia, a dual-track racing wooden coaster that really pours on the speed, and Hurakan Condor, a drop tower ride that rises to insane nosebleed levels. For younger children, the SésamoAventura (based on Sesame Street) land offers plenty of cute rides and play areas. In 2019, the park is introducing a Sesame Street-themed dark ride. Among its characters will be a life-sized Big Bird animatronic. The lovable Muppet, Grover, will guide guests through an interactive adventure that will include visits to the Count’s castle and into Oscar the Grouch’s trash can. Passengers will be armed with zappers and will be able to rack up points during the ride. Visitors who shy away from extreme thrills and are out of the Barrio Sesamo demographic will find plenty to do at the park. The Sea Odyessy 4-D motion simulator theater offers a pair of different movie rides and is well done. Live shows, which include rollicking presentations themed to Polynesia, Mexico, and the Old West, are a hoot. And there are more toned-down attractions, including a trio of water rides: Tutuki Splash (splashdown ride), Silver River Flume (log flume), and Grand Canyon Rapids (river rapids). The park isn't big on characters. Woody Woodpecker, a holdover form the Universal era, is the star. Curiously, Betty Boop, who harks back to the early black-and-white days of cartoons, also has a home at PortAventura. The Barrio Sesamo/Sesame Street gang rounds out the cast. The resort's hotels, oceanside location, and full-featured water park make it an appealing, multi-day, vacation destination. In fact, many visitors to PortAventura travel from throughout Europe, including France, the UK, and, increasingly, Russia. As with other major European attractions, the diversity of its audience makes for a curious mix of cultures and dialects (and requires the park to keep the dialogue in its shows to a minimum). Salou, Tarragona, Spain, about one hour south of Barcelona. The address is 43480 Vila-seca. By train- The resort has its own station. High-speed train from Madrid, Guadalajara, Calatayud, Saragossa, and Lleida goes to Camp de Tarragona. Transfer to the Ràpid Train to PortAventura. By plane- Reus Airport (Tarragona) is about 15 minutes away. El Prat Airport Barcelona is about one hour away. By car- AP-7 to Exit 35, Salou/Tarragona. Follow the signs to the resort. Admission to the park includes all attractions and shows. There is a discounted rate for junior passes (ages 4 to 10) and seniors (60+) as well as the disabled. 3 and under are free. The park offers discounts on passes for guests arriving after 7 p.m. 2-day passes as well as season passes are available. Parking is additional. Discounted tickets are often available by purchasing them in advance on PortAventura's official Web site. Note that a separate ticket is required to enter Ferrari Land. A separate ticket is also required for admission to PortAventura Caribe Aquatic Park. Combo passes for two or all three parks are available. As in all of Spain, dining is taken very seriously at PortAventura. In addition to the usual fast food and quick bite stands, the park features a surprising number of sit-down restaurants that offer fare such as tapas, Italian, seafood, Chinese, and Mexican. Make reservations as early as possible, because demand for the popular restaurants is high. PortAventura Caribe is a large-scale water park with plenty of watery diversions. Not unlike the resort's nearby Hotel Caribe, the park features a Caribbean theme. (Hmm. Do any attractions in the Caribbean adopt a Mediterranean coast theme?) Among the park's highlights are the large Bermuda Triangle wave pool, the splash-filled El Rio Loco, and the huge Laguna de Woody interactive play center. Interestingly, the park includes an indoor zone with slides and activities for younger kids ensconced in a cooler, sun-free (and rain-free) area. The full-fledged destination resort offers five onsite, themed hotels. In 2019, it will be opening its sixth hotel, Colorado Creek. The PortAventura Hotel is open year-round and offers convention and business meeting space. Room packages include tickets to the parks, breakfast, and transportation to the parks. Amenities include access to the oceanside Beach Club, three golf courses, convention and meeting facilities, and restaurants. The park celebrates both holidays with themed events. For Halloween, there are monsters on the midways, haunted trails, special shows, and a parade. For Christmas, PortAventura gets dressed up with twinkling lights, offers special shows, and features visits from Santa Claus.